Vijay Ramani moves all in, John Richards moves over the top all in and action goes to the original raiser, Mike @EastCoastRossyy. A bit of time passes, the shot clock expires and Ross announces he's folding, and he flashes Ace_King, drawing a gasp from both all in players. Ramani (above) shows Pocket_Eights and is in bad shape against the Pocket_Nines of Richards. 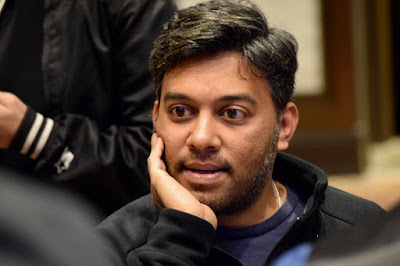 The board runs out 6-J-J-5-8, Ramani catches his two-outer to survive and Ross also survives, for he would have been eliminated by the sidepot going to Richards if he has called off his stack holding Ace_King.